There is an ancient and unending love in the universe that is willing to see us through the toughest of times and bring us to a wholeness that is unimaginable when we are immersed in the struggle of living. That is the ultimate message of this book. It is the story of one woman’s struggle to find normality and happiness while fighting the demons of the past. It is the story of God’s work in Dorothy, allowing her both the sadness and privilege of wading through the marshlands of depression in order to find a way not just to keep from sinking, but to live on the higher ground where she can feel secure and happy. Even if we’ve never experienced depression, we all know someone who has. Here is good news. Dorothy Neilson does not spare herself in relating her own story, through excerpts from her diaries and later reflections, telling of her trials and triumphs. Dorothy provides tool-kits, practical helps, scripture references, and insights replete with emotional and spiritual wisdom; but ultimately what this book offers is hope. The intensely personal narrative moves from the particular to the universal; what we learn about Dorothy we learn about ourselves. Dorothy’s honesty, self-awareness and courage inspire us all to a life more complete, and her faith puts us in touch with the God who is real. Dorothy has done a very brave thing—she has been honest! In that vulnerability she creates a space for us to join her in honesty but she also provides the tools to manage that raw reality from which we are tempted to hide. If you have ever been depressed this book will resonate with you; if you would like your depression to be a stepping stone and not a stumbling block, this book is for you. In Me, God and Prozac Dorothy shares her story of depression with honesty, wisdom and humour. Through painful personal experience she has found tools which helped bring healing. 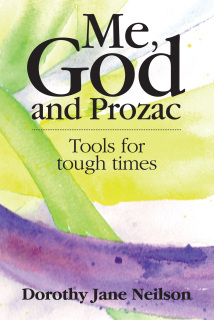 Her desire that depression should have a purpose is fully expressed in this book—both of finding God in the mess and compassionately offering to others tools for healing. As a GP and fellow depression sufferer I recommend this book both to any who are depressed and to those who care for someone who is—it could change your life!